One day my wife came home with a surprise. While driving home she noticed one of the houses down the street had put a powerwheels vehicle out to the curb on trash day with a sign that said "FREE". She quickly loaded it into the back of her car, and brought it home. Of course being it was destined for the trash, I figured it was going to be missing something important to function. This story chronicles the Restoration of this PowerWheels Jeep to is former glory, and then beyound. It was in pretty bad shape. It looked like a tottler abandoned in the backyard for a few years where the sun had its way with it. The plastics were sun bleeched, the stickers were cracked and ripped up. Plus it was missing the battery. But if the motors were still good it had potential. One thing I learned years ago was that when you heat plastic it returns back to its original color. I first washed the entire vehicle with soap and water to remove any dirt. Then I used some rubbing alcahol to help remove the stickers and any residue. Then I went to walmart and bought a heat gun. The heat gun set me back about $20. Then I gently applied heat to a section of the hood. The whiteish green hood, instantly turned back to its original bright neon green. I had to be careful to not over heat the body as the plastic tended to warp and deform when it was heated for too long. I just heated it enough until the color came back. 4 Hours later the entire body had been restored. I also used the same technique on the interior. This took the interior from its grayish color to a deep black. I had a couple spare UPS batteries sitting around. These were 9 Amp Hour 12 Volt Sealed batteries. I connected a single battery just to test if the motors were still good. I pressed the gas, and both wheels spun. 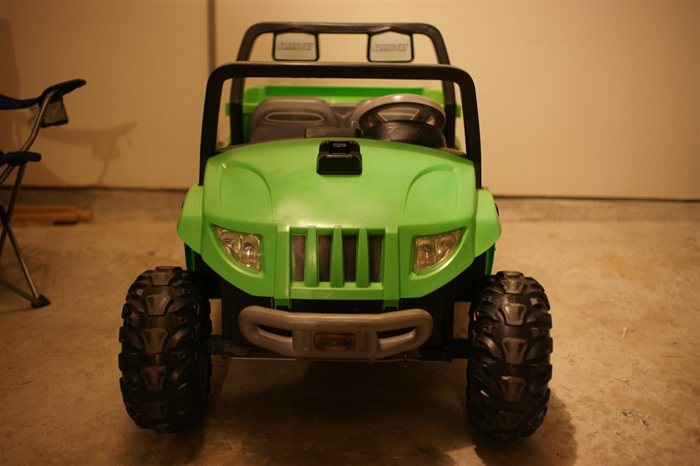 The factory battery on most PowerWheels vehicles is 6V or 12V. The Jeep in our project normally would run off a 12V power source. 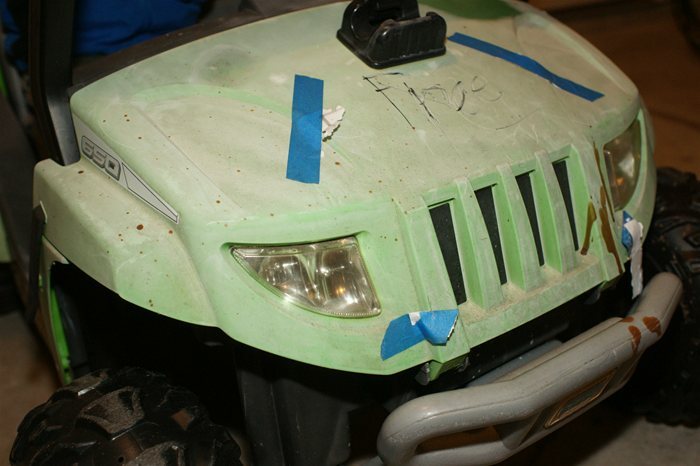 The Jeep has 2 small electric motors connected in series with 1 motor on each rear wheel. 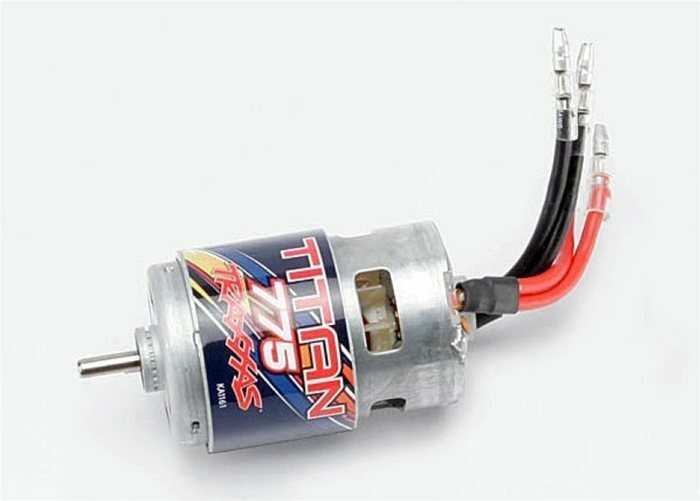 The motors are rated for 12V, meaning its safe to push 24V to the two of them when connected in series. I connected the 2 batteries in series giving it 24 Volts. It was by far the fastest power wheels on the block. After a day of riding I would use a car battery charger to charge each battery individually. I set the charger to run 5 Amps. usually the batteries were fully charged after about 8 Hours. I could have adjusted the charger for 10 Amps, but with batteries like this slower is better. After about 6 months of my sony Enjoying his PowerWheels, I decided that it could be faster. So I purchased an additional UPS battery of the same Voltage, Size and Capacity as the First 2. 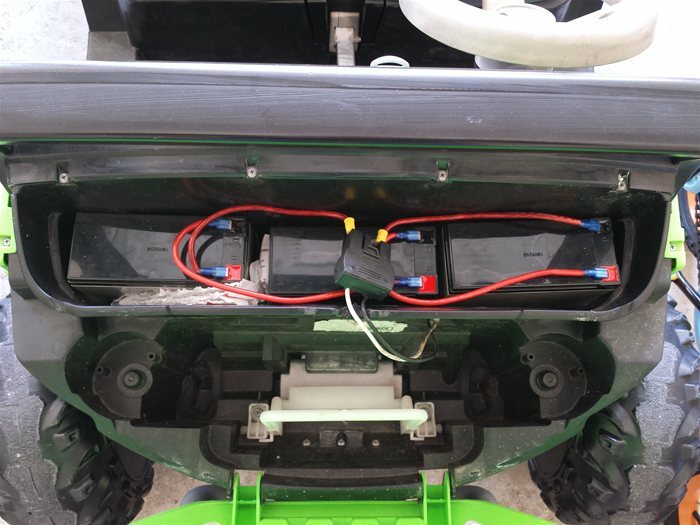 I added this third battery in series with the other 2 batteries, bringing the system up to 36 Volts. The result was a very fast vehicle. When my son would hit the gas the rear wheels would just spin ( no traction ). He like it, and his mother insisted he start wearing a helmet. After a couple of days of riding his new 36V modifed powerwheels vehicle, he came in saying it wasn't working. I was expecting that maybe 36V were too much for the 2 motors, and I had burned them out. However when I took the vehicle apart both motors still worked. What I did find was one of the leads on the motor had broken off. Even though it might be repairable, I didn't see any easy way to take the motors apart for the repair. So my next step was to replace both motors. I had spent some time reading online about how to take your PowerWheels vehicle to the next level. The motors in Powerwheels cars are really just RC motors. The same kind used in Remote Control Cars. So After much research I ordered a pair of 775 Traxxas Motors to replace the stock motors. I also ordered a pair of Pinion gears for the motors. 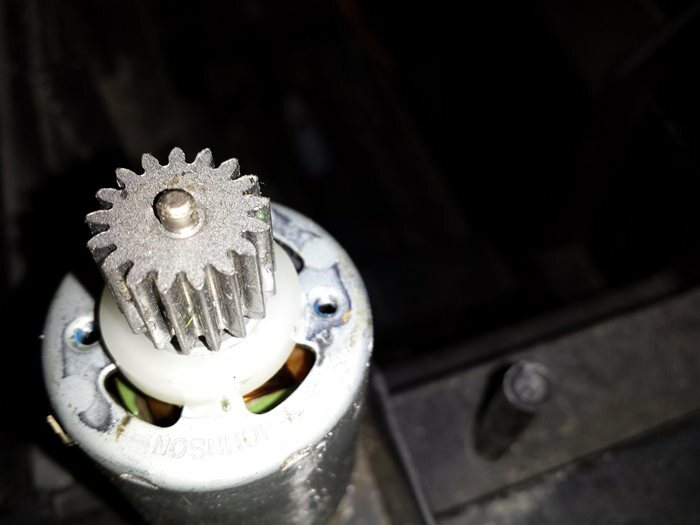 Its important that when you do an upgrade like this you make sure the Pinion Gears are the same tooth size and count as the stock pinions, else you risk shreading the gearboxes. The install went pretty smooth. I did have to visit my local hardware store to buy some screws of the correct size and thread pattern to mount the new motors to the factory gearboxes. Another issue was the way the rear wheels were mounted to the axel. Rather than using nuts to keep the wheels on they are held on with friction washers. however I don't think they are reusable when you remove them, as the wheels would keep falling off. So I opted for a more reliable solution to keep the wheels on. I drilled a hole through each end of hte axel, then I used a coter pin and a washer to keep the wheels one. This worked great. Above is a view of the motors when the seat is removed. The Traxxas 775 motors are rated for 16.8 Volts, so running 36 Volts ( 3 batteries in series ) works well. These are much bigger motors than the stock motors. They are configured for torque rather than high speed. There are other motors that are configured for more speed and less torque than the 775 motors, but I read they tend to have issues burning out. A good choice with larger dual motor vehicles. The vehicle doesn't slow down in the grass either. I estimate it goes about 10 - 12 MPH. Recently my son said the Jeep wasn't working, The problem was it was only doing reverse. The shifter had jammed. I took the shifter apart and noticed it had 2 relays. After examing the 2 relays I was able to determine that one was for the direction of the current ( forward or backwards ), and the other was for applying the voltage in series or parrarel. 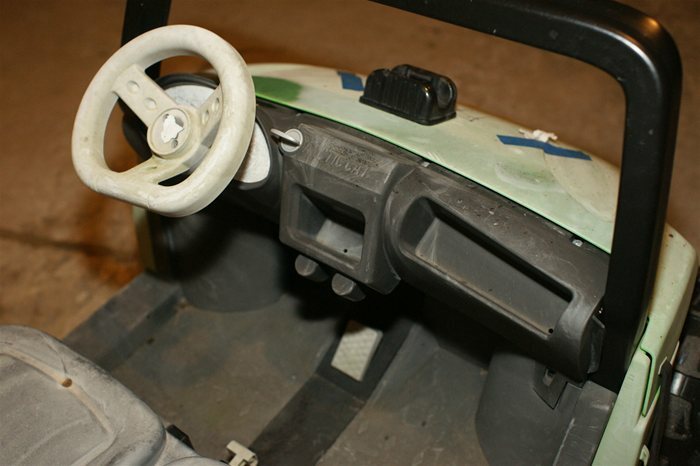 However with the design of the shifter it never would toggle the Voltage relay. This meant that it was essentially fixed to deliver the power to the motors in series. So for my setup with 3 x 12V batteries, each motor would get 18V. But with a flick of a switch, each motor would get the full 36V. So for fun I manually flicked the voltage switch, and let my son take it for a spin. At first when he hit the gas the car just spun tire. So much power that they plastic tires had no grip. Once it started moving forward, and he turned the wheel the car would do donuts. Basically way too much power. When he was able to drive fowards the Jeep would get up to over 20 MPH. On Flat ground for short distances this would be ok, but I was concerned that he would try to drive up a curb going 20 MPH, would could potentially damange the Jeep, and possibly insure him. The other issue is I am not sure how well the Traxxas 775 motors would hold up to a 36V charge, considering they are rated for 16.8V. For short bursts it might be ok, but for longer runs I am worried they might burn out the motors. I was able to replace the reply with a push button timed replay. something that could be mounted on the dash as a kind of NOS button for short bursts of power, this might be functional. Its looks like by simply switching the shifter to one with more travel, would enable the second relay for twice the speed. 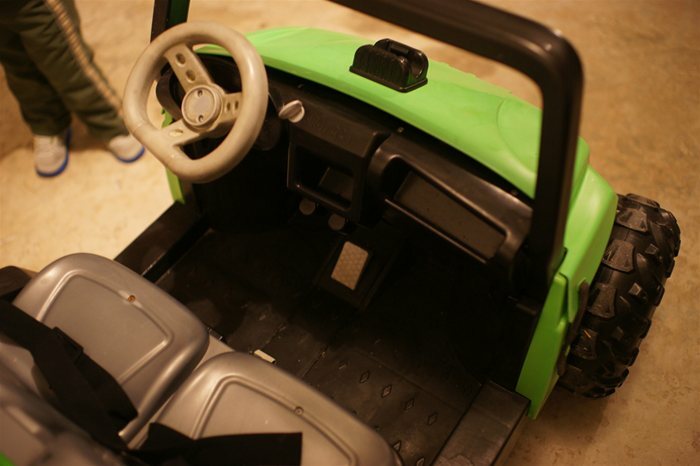 This is likely how other powerwheels are configured that have a 2 speed setup. Upgrading PowerWheels to go faster is relatively easy. Highly recommend a project like this. Start off with adding an extra battery, then for the true enthusiast upgrade the motors. If you take on this project do your research for your particular vehicle as not all vehicles use the same size motors or pinion gears. Also remember safety first. Putting a 2 year old in a powerwheels vehicle that can do 25 MPH might not be a good idea. Smaller children tend to think its cool to try to chase other kids or animals with their powerwheels. 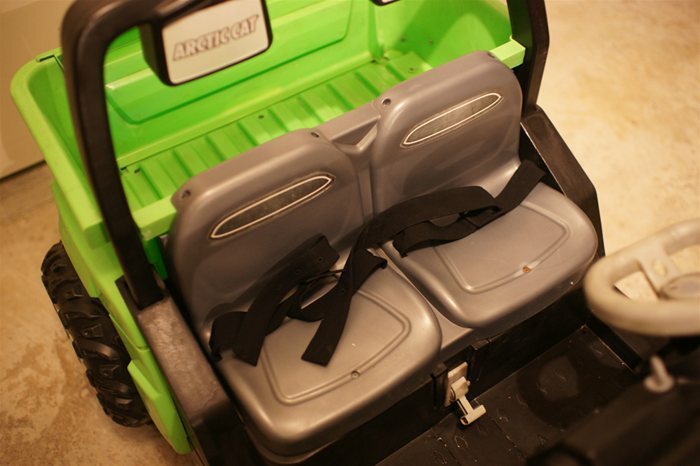 Make sure your child is mature enough for a Modified PowerWheels Vehicle. Where did you buy the "I also ordered a pair of Pinion gears for the motors." the pinion gears for the new motors. I have a simlar set-up, using the Jeep Wranglers, however with 2 batteries (the same UPS ones from your pict) My son has fried 3 motors so far. Any ideas on why? I even installed a 24V fan and drilled holes to help keep everything cool. My nextstop is buying proper 24V motors I guess...But how do I attach the gear to the new motor? I can force the current gears off the blown motors to ensure they are the right size. Something to keep in mind with my original setup. Even though the 3 x 12V batteries make 36 volts, the relay in the shifter would only push half of that to each motor. So in my case each motor is getting 18 volts. The Traxas 775 Motors I upgraded too are rated for 16 Volts. so I am not pushing them that hard. 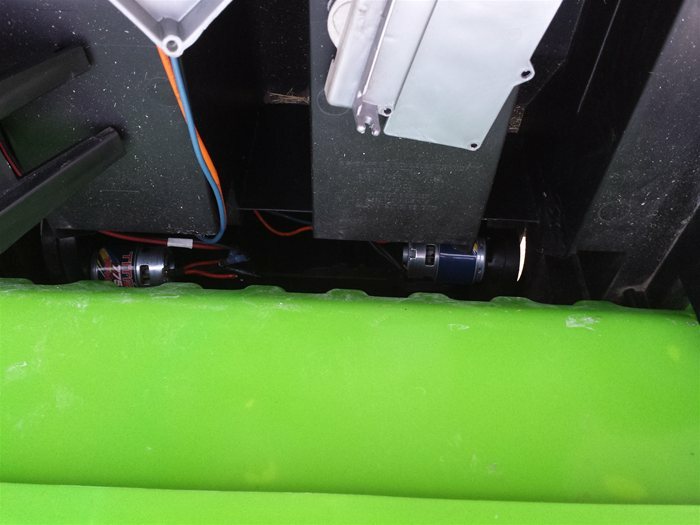 Check to make sure your setup with 2 batteries is not pushing 24 volts into each motor. That will burn them out very quickly. The pinon gears on the original motors do not come off. At least I couldn't find a way to take them off. You will have to get some pinon gears that are the right tooth size for whatever motor you decide to go with. The 775 are good motors. Lots of torque. Doesn't slow down on grass, or hills. There are other motors that will give you more speed but they will lack the torque. Good luck with your project! Hey I'm so glad I found this!! You're power wheels looks awesome!! 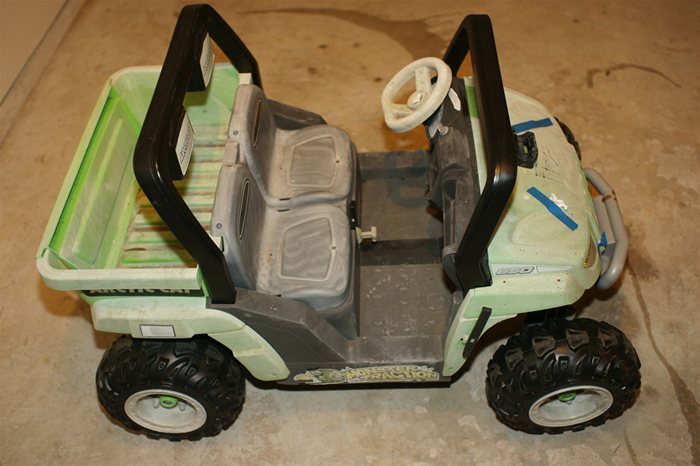 I have a power wheels that Im trying to restore.I washed away all the dirt and stickers. I went to walmart and got the heat gun and started the process! The color is trying to come back but I seem to be having a problem with the mildew stains. Did you have to go over it several times? Also did you use the heat gun on low or high setting? Thanks so much in advace!! I hope you're still following this post! I recommend sanding anything that isn't just sun bleached. 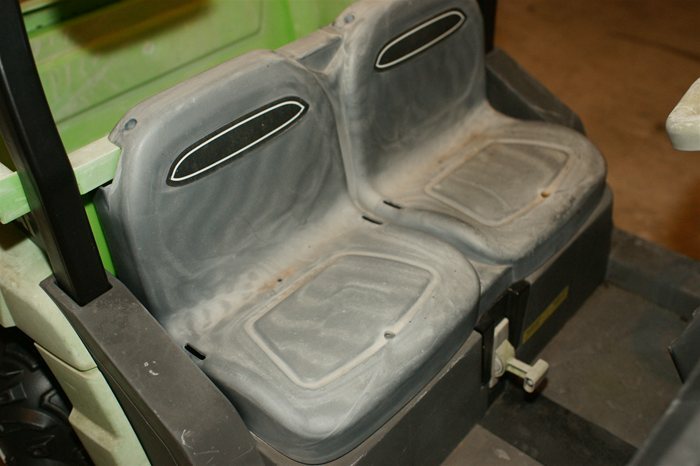 Dirt should come off with soap and water, anything that is deeper you can use some sand paper or brillow pads to remove it before using the heat gun. I use my heat gun on high, just be careful not to stay on the same spot for too long as after the plastic is melted it will start to deform and bubble. You just want to get it hot enough for the surface to melt, but not everything underneath. Hope this helps! Just reverse the wires around it and spins the other way. I am pretty sure the 775 are all built the same, no special timings. You will love them. Your unit will climb hills without even slowing down. Just don't do anything like me and attempt to beef up your wheels for better traction, quick way to strip the gears in your gearboxes. Where did you order the pinion gears, I am having ahard time finding a place to order them. (I'm in Canada). 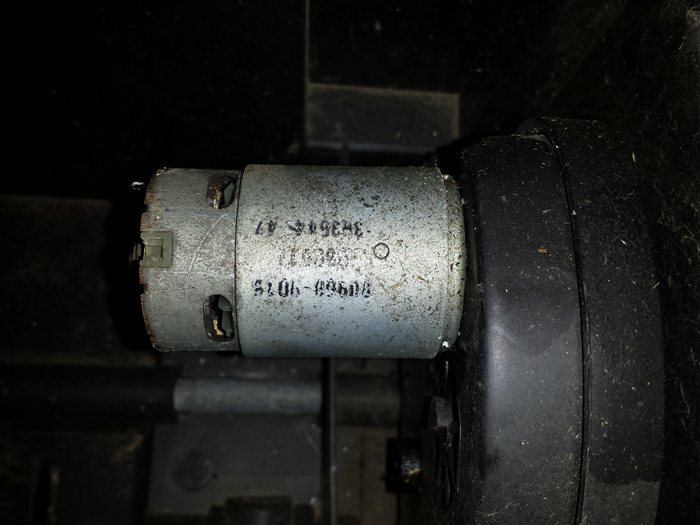 I was able to get the ones off the factory motors and used JB weld to attach them on the new motors, the problem is I cheaped out and bought some no name motors from china, they work but are much louder and slower than the orginal motors, so the specs on them must be wrong. I'm going to orderthe traxxis ones now but needto find the pinion gears. This is one of the coolest projects I have seen! Thank you so much for sharing. Do these have a weight limit because I would love to try this out for my own personal use!? Just wanted to give everyone a heads up. I am also selling 1 good gearbox with gears, and the 1 bad gearbox with a couple of broken gears. The Oversized Rims and Tires are also for sale. I wrapped them in Duck Tape to help the traction and increase the life, but this was not a good idea for the drive wheels. There are a couple of holes in the tires, but they still have life left in them. The only motors have experience with are the Traxxas 775, which I highly recommend. You can buy them for about $30 each. Somtimes less on ebay. 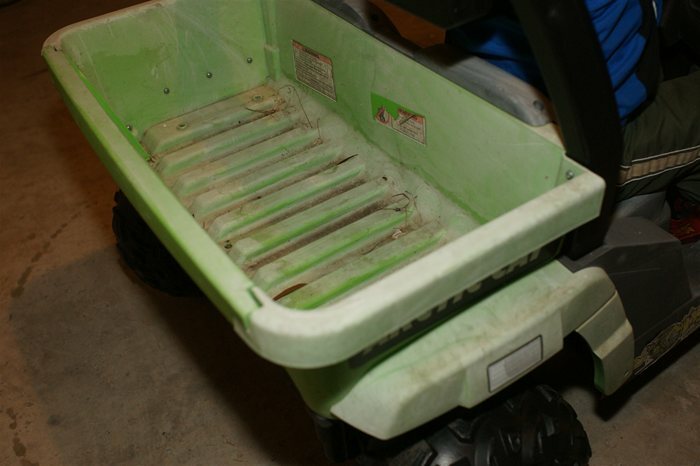 Safety wise, keep in mind powerwheels don't have a suspension, meaning every bump takes a tole on your wheels and frame. If you are going too fast this can cause major damage if you go up a curb. My Project took me a couple of weekends. It was a general progression, Add more batteries, Add Bigger Motors, Add Bigger Tires. Does the shifter have the relay in it already or is that something i have to install? 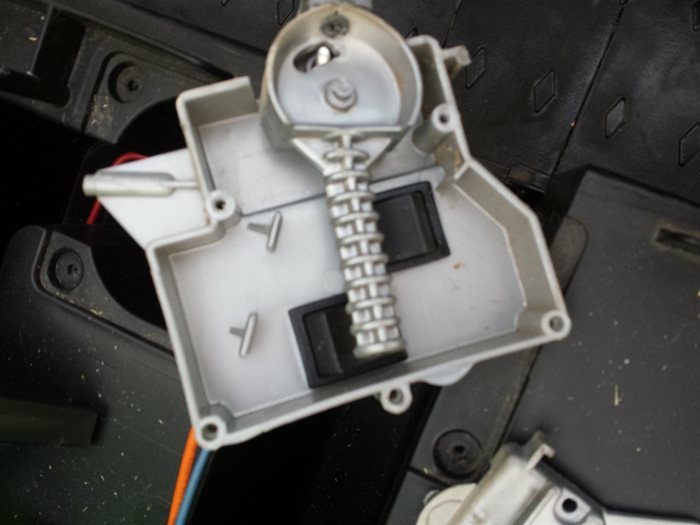 Also, whta gage wire did you use to dasy chain the batteries together? The relay is built into the shifter. I had some spare 10 guage wire I used to chain the batteries together. However The wires going to the relay and the motors was maybe only 14 guage at the most. If you wanted to do it right you would need to upgrade the wiring on everything to 10 or 8 gauge. Can I pay you to build and customize a new power wheels for me? Hey Will, I have too many other projects going on right now. So unfortunately I don't have the time to help. I have long since parted out our powerwheels vehicle. Already sold the motors. I have 1 good gearbox, 1 bad one, and all 4 tires in various states of wear. They were starting to get holes so I wrapped them in gorilla tape. Not recommend as this puts additional stress on the gearboxes. I also have the 3 x 12V gel cell batteries that I used to power it. Looking to sell all the parts if you were interested. But unfortunatley I couldn't help you with the install. Wow, you did a great job!! Looks like a lot of fun. We have just bought a well loved one and the kids got to use it for about a week and it won't work in forward just reverse...any thoughts at where my hubby should look first?? Most likely its the relays. If you take out the shifter assembly, you will find some relays inside. They control the direction of the current. Willing to bet one is bad.